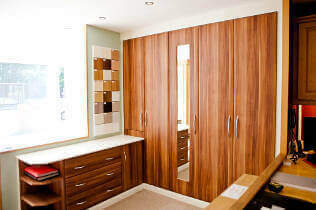 Arrange your free, no obligation bedroom design appointment. 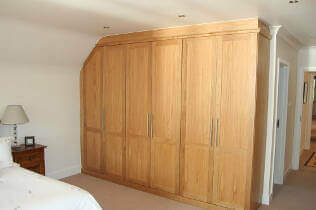 We build bespoke furniture in our Kent-based workshop, helping you create your dream bedroom. With clever storage options and furniture that can be tailored to fit into any space, we can design a bedroom that is both practical and beautiful. Our bedroom furniture is available in traditional and contemporary styles to fit in with your ideal aesthetic. We have a team of experienced designers and fitters who will manage the process from beginning to end, making sure you are completely happy with the outcome. Everything is completed by our in-house team, not sub contractors, meaning the process will be simple and efficient. The people who arrive to install your bedroom furniture will already know your property and will understand exactly what you want. We achieve the perfect fit every time. Our service is all about making the best use of the space you have available. Even if a room is an unusual shape, we will craft bedroom furniture to fit. Everything is handmade and completely bespoke, so we can make you something truly unique. When we say our furniture is unique, we really mean it. 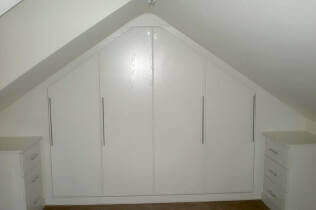 All our fitted wardrobes and furniture ranges are made on site in our own Kent-based workshop. Meet your unique requirements and tailor all our furniture products to you. If you want a different colour or have a unique idea in your head, just let us know. Make any adjustments we need to when fitting. 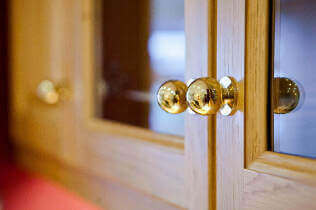 Fittings usually take a day or less and if we need to make adjustments, our skilled fitters can make them on site, so we don’t need to book in a time to come back. Design and fit a bedroom that is perfect for you. Fitted bedrooms are all built in, so they look like they were meant to be there. Our bespoke bedrooms are made just for you. We will be happy to discuss your ideas and draw up plans that are designed to meet your individual needs. Our project managed service and beautiful bespoke wardrobes have left us with many happy customers across Kent, South London and Surrey. 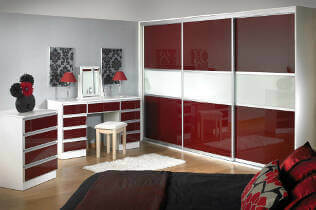 Our ranges can be completely customised to suit your particular bedroom. Browse through to find a look you like, from the traditional to the contemporary. Affordable MFC flat panel hinged door range. Luxury solid wood and wood veneer. Affordable steel frame sliding door range. MDF core vinyl-wrapped sliding doors. The finishing touches for your furniture. 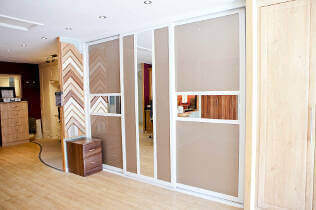 Our West Wickham showroom is the perfect place to start. Come along, look at our products and find out what we can do for you. Pop in between 9am and 5pm Monday to Friday, or 9.30am and 4.30pm on Saturdays. We are based at 20 Station Road, West Wickham, Kent BR4 0PR. See how we can transform your bedroom. Arrange your free, no obligation design appointment.